Dutch jurist; born at Hoorn Jan. 24, 1813; died at Amsterdam May 15, 1878. 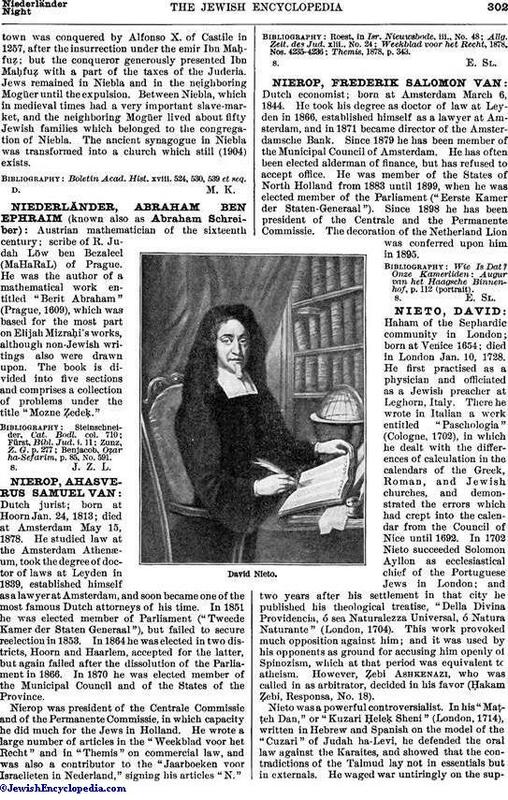 He studied law at the Amsterdam Athenæum, took the degree of doctor of laws at Leyden in 1839, established himself as a lawyer at Amsterdam, and soon became one of the most famous Dutch attorneys of his time. In 1851 he was elected member of Parliament ("Tweede Kamer der Staten Generaal"), but failed to secure reelection in 1853. In 1864 he was elected in two districts, Hoorn and Haarlem, accepted for the latter, but again failed after the dissolution of the Parliament in 1866. In 1870 he was elected member of the Municipal Council and of the States of the Province. Nierop was president of the Centrale Commissie and of the Permanente Commissie, in which capacity he did much for the Jews in Holland. He wrote a large number of articles in the "Weekblad voor het Recht" and in "Themis" on commercial law, and was also a contributor to the "Jaarboeken voor Israelieten in Nederland," signing his articles "N."